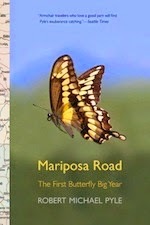 If there is one quotation all physicists love more than any other it is Rutherford’s magnificent put down ‘All science is either physics or stamp collecting.’ And frankly, when it comes to science, Mariposa Road sits firmly in the stamp collecting class. To be fair, Rutherford’s remark was not quite as negative as it seems – ‘stamp collecting’ in the sense of collecting and collating information as is typical of natural history is an essential part of science – but to make for something to get your teeth into it helps to have the other bits too. The trouble, then with this book, which according to the subtitle is ‘the first butterfly big year’ (if that is as meaningless to you as it is to me, I think the idea is that it is the account of year spent trying to spot as many different butterflies as possible within the United States), is that unless you are deeply interested in butterflies (and I am afraid I only have a passing interest), the excitement palls after about the fifth species. Don’t get me wrong. There is really interesting science in butterflies – just read the excellent book Metamorphosis – but not in cataloguing butterflies someone else has seen. You might wonder why I bothered at all. It’s because I love the right kind of personal travel narrative. Pretty well any of Bill Bryson’s travel books, for instance (all better than his popular science book, for all its sales), or even something more quirky like Stuart Maconie’s Pies and Prejudice. But sadly not the approach taken by Robert Pyle. It’s not bad, but it is simply too gentle, too much a personal journal than an entertaining narrative. I just wasn’t that interested, I’m afraid. Not one for me then. If you love butterflies, you may find it makes all the difference… but otherwise a less than exciting read.